Ladies, we’re always up for that au naturel look that just brings out that inner glow in you, and a brand that caters to this need of ours is, in our minds, a keepsake, don’t you think? We’ve found one such brand that has all its ingredients sourced from natural origins to help you shine (pun intended!) and we tell you why it stands out. Global Beauty Secrets is the brainchild of Aishwarya Sawarna Nir, a young and dynamic beauty enthusiast, who has conceptualized the brand with her own personal experience using natural ingredients like honey, milk, saffron and more. She grew up being influenced by these natural ingredients, helping her understand them better and further giving birth to Global Beauty Secrets. The brand’s end goal is for women around the world to nurture themselves with the right kind of products that are easy to use and rich in natural properties. Global Beauty Secrets as a brand has brought together unique ingredients used globally for flawless and healthy skin. 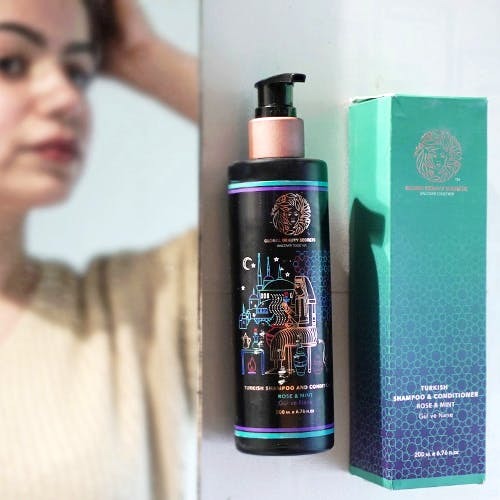 We were pretty much sold at their gorgeous packaging and were super keen to try these 2 new products- Turkish Rhassoul Clay Hair Mask and Turkish Rose and Mint Shampoo and Conditioner. We heard that the Turkish women had an extraordinary love affair with their hair and we can relate too. The Turkish Rhassoul Clay Hair Mask consists of Rhassoul Clay which is sourced from the Atlas Mountains in Turkey. This organic and intense hair mask is enriched with olive oil, honey and vitamin E and must be used once or twice a week for voluminous, well nourished and lustrous hair. Pair the Hair mask with the Turkish Rose and Mint Shampoo and Conditioner. The shampoo & conditioner consists of Rose oil, which is used in the Turkish tradition of Hamam for cleansing, while mint is used for rejuvenation, soothing and healing. This shampoo and conditioner consist of rose extracts that’ll strengthen hair roots, promote hair growth and revitalizes the scalp. Good hair, all day, every day. We love the fact how each of the product packs in the benefit of an ingredient specific to a country and popularly used by women from all walks of life. Awesome, right? Use these products on a daily basis to see significant results, and we’ll make it a notch higher by saying that all their products are 100% vegetarian. There’s an expansive range of products from other regions that might just fascinate you. Still contemplating? Don’t! Learn more about the products, history & legacy on their website. Follow them on Facebook & Instagram to stay updated about any new launches & offers.